Do you remember the old game “Telephone” where one person whispers a phrase to the next person who whispers it to the next and so on down a line until it reaches the end. The last person then speaks the phrase out loud, and then the first person announces the original phrase and everyone laughs at the remarkable change it has made. This game is even more funny if it is done with a language translation chain. I know of one case where it was played with a joke which went through about 7 languages and managed to pick up an extraneous goat by the time it got to the final translation. My CD, Travels With Dulcimers, was picked up by a Polish website and the final track, Trip to Durrow/ Boy in the Gap ended up renamed as Trip this Sorghum/ Page in the Gaping Spectator. When the bough bends, the cradle will rock. And the poor little thing cries mammy! “Hush-a-bye” comes from the African-American tradition and there is speculation that the woman is singing a lullaby to her master’s white baby while her own, the “poor little lambie” lies alone in a shack in the field. What’ll I do with the baby-O, what’ll I do with the baby-O? Every time the baby cries, stick my fingers in his eyes. That’s what I’ll do with the baby-O. That’s what I’ll do with the baby-O. Throw him in the ditch and he’ll be dead! Most people think of bagpipes as coming from Scotland and perhaps Ireland as well, but the truth of the matter is that one can find indigenous bagpipes in almost every country in Europe as well as north Africa and western Asia as far east as India. Some countries have as many as twenty or more different kinds of bagpipes. There are literally hundreds of different varieties of bagpipes in the world. They differ in scale, range, reed set-up, material of the reeds, single or double reeds, one to three drones or no drones, chords or no chords, single or multiple chanters, material of the chanters, chromatics, some have metal keys, material and size of the bag, bag covering or no covering and dozens of aesthetic considerations. I have about a dozen bagpipes in my collection, mostly from Bulgaria, with two from Macedonia (one of which is playable), two from Serbia and one from central France. 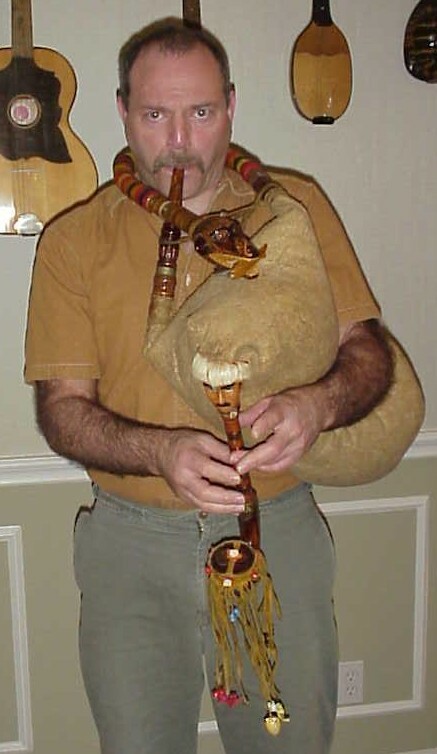 Although I mostly play Bulgarian bagpipes, the Serbian pipes are great fun as well and have more personality than any of the other instruments. I acquired them on my first trip to the Balkans back in 1972, when armed with the addresses of a number of bagpipe makers, I went from village to village and really got to absorb the Balkan culture. The picture below is a gajda from Niš (pronounced Neesh), a city in east Serbia. It was made by Dušan Stoyanović, a master craftsman and musician. It has a double chanter and a low drone made from rubber hose with a snake’s head carved at the terminus. In the snake’s mouth is a wooden fish, all carved from a single piece. In the fish’s mouth is a clip in which a dancer would put money so that the bagpiper would play a requested dance. The more money given to the piper, the longer he would play the requested tune. The traditional way of receiving the money would be to slap it on the piper’s sweaty forehead. At the top of the chanter, Dušan has carved an excellent likeness of himself and the turn out of the sheepskin bag makes it look as though he is wearing the traditional hat of east Serbia. Of course, by the time I met him, his hair was white. The bell of the chanter is covered in leather suede and adorned with tiny plastic flowers. The various doodads hanging from the leather fringe at the bottom of the chanter are mostly the kind of cheap trinkets one would find in a bubble gum machine in the 1960’s. I was always struck by the irony of such a magnificent piece of craftsmanship and the cheap decorations. Mixed in among the plastic toys is a miniature opanci (traditional Serbian shoe), a fake-ivory egg covered with rhinestones, and a small ivory hook which would be used to adjust the beeswax used for tuning the holes in the chanter. The sound of the instrument is very pretty and sweet and relatively quiet. Totally unlike the strident reedy sound of the Scottish war-pipe. Here’s one from near a local golf course when I lived in Binghamton, NY. I guess those 4 wheel drive golf balls were a big problem. Ever since I was a little kid, I’ve been surrounded by instruments. My parents always had a significant collection of stringed instruments hanging on the wall, and I grew up listening to my mother playing piano and my sister playing harp, so music has always been a big part of my life. My grandparents traveled around the world and usually brought back some of the local instruments from wherever they went. As I grew up and began to travel, I also started acquiring instruments from the places I visited, and when my grandparents died, I inherited their collection as well. As an adult, my instrument collecting became more focused, and more extensive, so by now, I have acquired several hundred different instruments from all over the world. Visitors really seem to enjoy viewing the collection, so I thought it would be a good thing to share some of it on YouTube. While preparing for the Sea Songs workshop at the Austin Friends of Traditional Music festival, I’ve been thinking about sailor recruitment. In the 18th and early 19th centuries in Britain, it was common practice to try to force young men into service in the navy. The crudest method was to knock them unconscious and have them wake up on the ship already in open waters, but a more legal nicety would be to give them money, usually a shilling, to go into service. Thus the expression, “taking the King’s Shilling” came into being. Of course most men of recruitable age were savvy enough to refuse taking money from strangers, but they would be more inclined to accept a drink from a new acquaintance in a pub, and the press-gang member would secretly drop a shilling into the tankard before handing it to the unsuspecting victim. Once he finished his drink (which was likely to be doped), he would see the shilling at the bottom of the tankard and realize in his groggy state that he was now doomed to spend the next part of his life in the king’s navy. Because of this, publicans began putting glass on the bottom of tankards, so that the customer could check to see if there was a coin there before accepting the drink, and the use of glass bottoms on tankards and ale mugs continues to this day. The best birthday present I ever got was a 12 week course in Chinese cooking with Florence Lin at the China Institute in New York. Of course after that I was expected to cook dinner once a week… Clever parents. Of all the things I learned, the one which made the biggest difference was peeling broccoli. A little paring knife to pull off the peel starting from the bottom of the stem, and what an incredible difference it makes to both texture and taste, particularly if you are going to stir-fry it. Mrs. Lin told us that the best Chinese chefs throw away the florets and the peel. Well, I’m willing to eat the florets or put them in a different dish. As for the peels, I boil them up and strain the broth as a base for a vegetable soup. Since that wonderful course in 1975, peeled broccoli has always been my benchmark for a truly top notch Chinese restaurant. Sad to say, I am usually disappointed.